The official ceremony for commencement of work year 2019 of Department of Animal Production and Health (DAPH) held on 01st of January 2019 at DAPH Peradeniya. 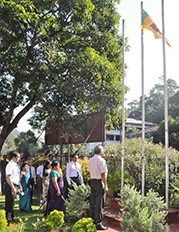 Director General, Dr. N. Wedasinghe hoisted the National Flag in the presence of all Additional Director Generals, all Directors and other staff of DAPH. The National Anthem sang after hoisting the National Flag. After observing two minutes silence to commemorate the war heroes and others who sacrificed their lives for the motherland and the Oath of Public Servants read by all staff. 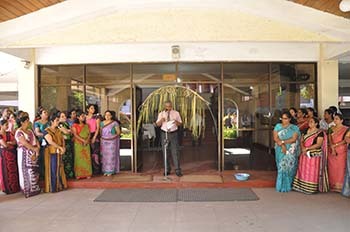 Director General delivered a brief speech and emphasized the necessity of ensuring the prompt, honest and unwavering contribution of all members of the staff, in the effort of creating a better tomorrow with a new economic and social order for the benefit of all Sri Lankans. 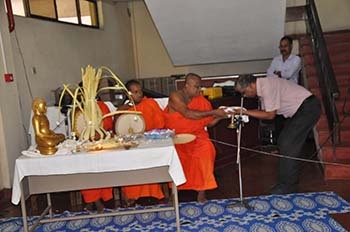 A Pirith chanting ceremony also conducted by “Viharadipathi” of DiyaKapanatota Rakkhanga Viharaya, Getambe, Peradeniya.